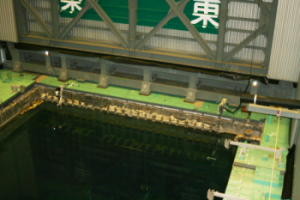 Work continues steadily at the Fukushima Daiichi Nuclear Power Plants toward the removal of spent nuclear fuel from the Unit-3 fuel pool, expected in November. A total of 566 fuel assemblies—514 spent and 52 unused—are currently stored in the pool. The target for the launch of the removal is clearly stated in the “mid-to-long-term roadmap” toward the decommissioning, and is one of the major steps in the decommissioning process to be taken this year. In contrast to the situation at Unit 4, from which the fuel assemblies have been removed, the operating floor of Unit 3 is subject to high-dose radiation, making extended human presence impossible. Therefore, all the work will have to be done remotely—something without precedent—first to remove debris from the pool, then to remove the fuel itself, and finally to place it in transport containers. The removal of large-size debris from the Unit 3 pool was completed in 2015. In the following year, the operating floor was decontaminated and shielding installed. In November 2017, remotely-controlled fuel handling equipment was put in place for the removal. In the remaining removal operations, minor debris that accumulated in the pool after the building’s explosion will first have to be removed. The two employees said that they had developed tools, including a cutter, to deal with concrete and cables. In anticipation of unknown situations, various other tools have been made available for suction, gripping and cutting. The crane ran into problems during trial operations of the fuel handling equipment, causing a delay in the work schedule. 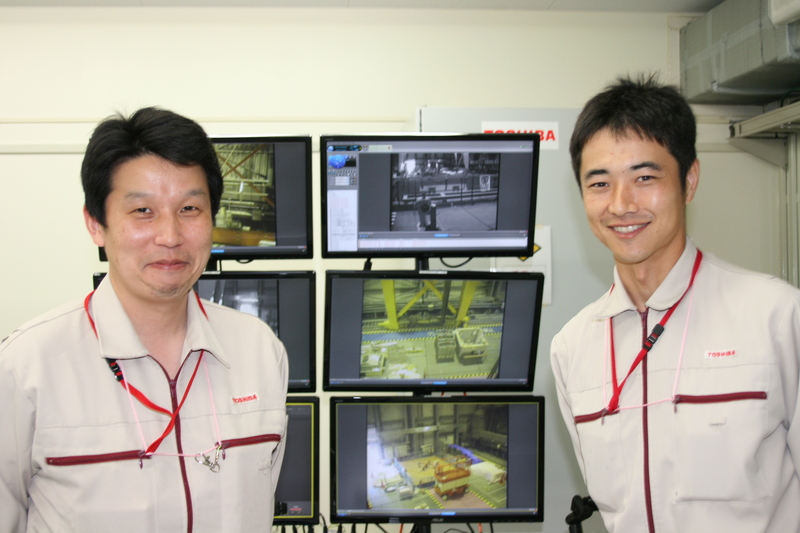 Mr. Tokura (left) and Mr. Itoh (right) of Toshiba Energy Systems & Solutions Corporation (Toshiba ESS), both interviewed after their early morning shift, sitting with a large monitor behind them. They described the remote control of the operations, which uses around forty cameras positioned at various angles. The handle of the remote control is very flexible. “While it is important to proceed steadily to avoid problems, with safety as the top priority, anything can happen” said Mr. Tokura, “so we must always think about what can be done with our technology.” The tension felt by both men was palpable. 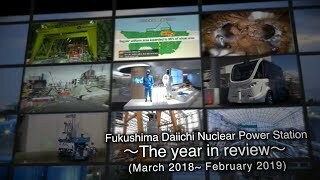 Mr. Itoh, talking about the installation of the equipment in the reactor building, said, “It was physically tough to work in full-face masks and protective suits, particularly in the summer.” He said that their constant concern was how workers could function effectively in such an environment. 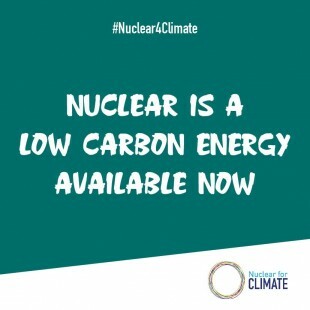 On August 10, representatives of the Tokyo Electric Power Co. (TEPCO) told a monitoring and evaluation group under the national Nuclear Regulation Authority (NRA) that the power company expects to start fuel removal some three months after trial operations are completed. In the interim, training sessions will be conducted using real equipment—operations comprising fuel handling, the loading of transport containers, fuel transfer, and the release of the arm’s catch—to improve workers’ techniques. 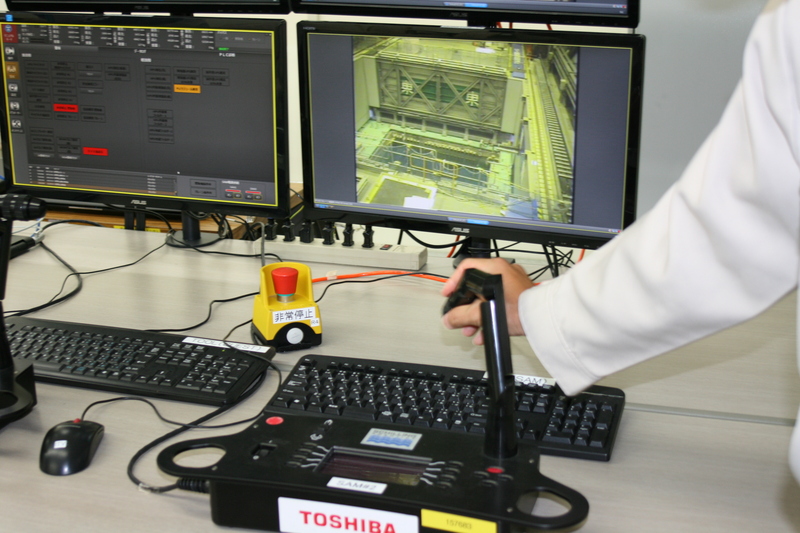 Everywhere at Fukushima Daiichi, workers coming and going shout out “good job!” and “work safely!” to each other in the way of greeting. At the International Forum on the Decommissioning of the Fukushima Daiichi Nuclear Power Station, held on August 6 in Iwaki City (Fukushima Prefecture), President Akira Ono of the Fukushima Daiichi Decontamination & Decommissioning Engineering Company said that the workers can now wear ordinary clothing or use light protective equipment (G-zone area) in most of the area—96%—thanks to efforts to reduce radiation levels. Besides alleviating the physical burden on the workers and improving their working efficiency, being able to wear less cumbersome outfits is also important in facilitating ordinary communications among them. 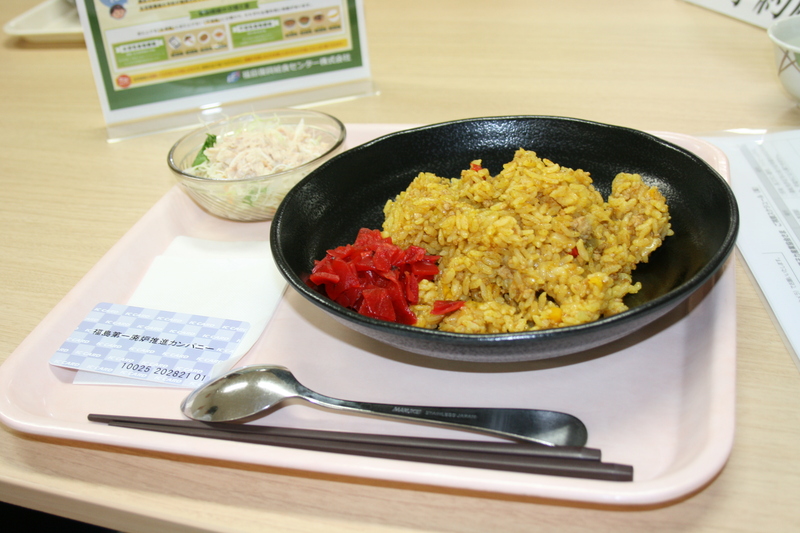 Dry curry—the special of the day—being served in the dining room at Fukushima Daiichi. 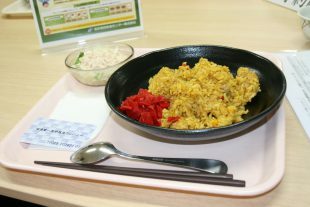 At the Fukushima Revitalization Meal Service Center in Okuma Town, the employees can either choose between set meals “A” and “B” for lunch, or select from among a noodle set, a rice-bowl set and a curry set. The set meals change every day, as the importance of variety is well understood, too. Along with understanding and support from the local communities, continuous improvements in the working environment are needed for the decommissioning to proceed smoothly, and for workers to feel that their work is rewarding and appreciated.